Your Hyundai is equipped with an advanced Supplemental Restraint (Airbag) System. The indications of the system's presence are the letters "SRS AIRBAG" embossed on the airbag pad cover in the steering wheel and the passenger's side front panel pad above the glove box. The Hyundai SRS consists of airbags installed under the pad covers in the center of the steering wheel and the passenger's side front panel above the glove box. The purpose of the SRS is to provide the vehicle's driver and/or the front passenger with additional protection than that offered by the seat belt system alone, in case of a frontal impact of sufficient severity. The SRS uses a collection of sensors to gather information about the driver's and front passenger's seat position, the driver's and front passenger's seat belt usage and impact severity. The driver's and front passenger's seat position sensors, which are installed on the seat track, determine if the seats are fore or aft of a reference position. Similarly, the seat belt usage sensors determine if the driver and front passenger's seat belts are fastened. These sensors provide the ability to control the SRS deployment based on how close the driver's seat is to the steering wheel, how close the passenger's seat is to the instrument panel, whether or not the seat belts are fastened, and how severe is the impact. The advanced SRS offers the ability to control the airbag inflation with two levels. A first stage level is provided for moderate-severity impacts. According to the impact severity, seating position and seat belt usage, the SRSCM(SRS Control Module) controls the airbag inflation. Failure to properly wear seat belts can increase the risk or severity of injury in an accident. Additionally, your Hyundai is equipped with an occupant classification system in the front passenger's seat. The occupant classification system detects the presence of a passenger in the front passenger's seat and will turn off the front passenger's airbag under certain conditions. For more detail, see "Occupant Classification System" later in this section. the instrument panel will illuminate even if there is no malfunction of the SRS airbag system, because the SRS airbag warning light is connected with the seat position sensor. If the SRS airbag warning light does not illuminate when the ignition key is turned to the "ON" position, if it remains illuminated after coming on for approximately 6 seconds, or if it illuminates while the vehicle is being driven, have an authorized Hyundai dealer inspect the seat position sensor and the advanced SRS airbag system as soon as possible. o Modification to the seat structure can adversely affect the seat position sensor and cause the airbag to deploy at a different level than should be provided. o Do not place any objects underneath the front seats which could damage the seat position sensor or interfere with the occupant classification system. o Do not place any objects that may cause magnetic fields near the front seats. These may cause a malfunction of the seat position sensor. o Be sure to read information about the SRS on the labels provided on the backside of the sun visor. o Advanced airbags are combined with pre-tensioner seat belts to help provide enhanced occupant protection in frontal crashes. Front airbags are not intended to deploy in light collisions in which protection can be provided by the pre-tensioner seat belt. o If you are considering modification of your vehicle due to a disability, please contact the Hyundai Customer Assistance Center at 1-800-633-5151. Always use seat belts and child restraints – every trip, every time, everyone! Airbags inflate with considerable force and in the blink of an eye. Seat belts help keep occupants in proper position to obtain maximum benefit from the airbag. Even with advanced airbags, improperly and unbelted occupants can be severely injured when the airbag inflates. Always follow the precautions about seat belts, airbags and occupant safety contained in this manual. To reduce the chance of serious or fatal injuries and receive the maximum safety benefit from your restraint system: o Never place a child in any child or booster seat in the front seat (see child restraints). o ABC – Always Buckle Children in the back seat. It is the safest place for children of any age to ride. o Front and side impact airbags can injure occupants improperly positioned in the front seats. 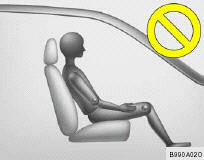 o Move your seat as far back as practical from the front airbags, while still maintaining control of the vehicle. 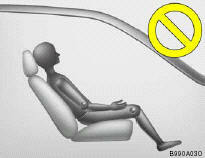 o Never sit or lean unnecessarily close to the front or side airbags. o Never lean against the door or center console – always sit in an upright position. o Do not allow an adult passenger to ride in the front seat when the “Passenger Airbag OFF” indicator is illuminated, because the airbag will not deploy in the event of a moderate or severe frontal crash. o Never place objects over or near any airbag module (front or side impact airbags), because these objects can injure passengers in a crash. o Never place covers, blankets or aftermarket seat warmers on the passenger seat as these may interfere with the occupant classification system. o Do not tamper or disconnect SRS wiring or other components. Injuries could result from inadvertent deployment or failure of the airbag to deploy in a crash. o If the SRS airbag warning light remains illuminated while the vehicle is being driven, have an authorized Hyundai dealer inspect the airbag system as soon as possible. o Airbags can only be used once – have an authorized Hyundai dealer replace the airbag immediately after deployment. o The SRS is designed to deploy the front airbags only when an impact is sufficiently severe and when the impact angle is less than 30° from the forward longitudinal axis of the vehicle. 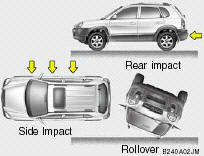 The front airbags will not deploy in side, rear or rollover impacts. Additionally, the airbags will only deploy once. Seat belts must be worn at all times. o Front airbags are not intended to deploy in side-impact, rear-impact or rollover crashes. In addition, airbags will not deploy in frontal crashes below the deployment threshold. o Move your seat as far back as practical from the front airbags, while still maintaining control of the vehicle. You and your passengers should never sit or lean unnecessarily close to the airbags. Improperly positioned drivers and passengers can be severely injured by inflating airbags. o No objects should be placed over or near the airbag modules on the steering wheel, instrument panel, and the front passenger's panel above the glove box, because any such object could cause harm if the vehicle is in a crash severe enough to cause the airbags to deploy. o If the airbags deploy, they must be replaced by an authorized Hyundai dealer. Deployed airbags WILL NOT inflate again and will provide no protection in subsequent collisions. o Do not tamper with or disconnect SRS wiring or other components of the SRS system. Doing so could result in injury, due to accidental deployment of the airbags or by rendering the SRS inoperative. o Even though your vehicle is equipped with the occupant classification system, do not install a child restraint system in the front passenger seat position. A child restraint system must never be placed in the front seat. The infant or child could be severely injured or killed by an airbag deployment in case of an accident. o Children younger than 13 years must always be properly restrained in the rear seat. Never allow children to ride in the front passenger seat. If a child over 13 must be seated in the front seat, he or she must be properly belted and the seat should be moved as far back as possible. o For maximum safety protection in all types of crashes, all occupants including the driver should always wear their seat belts whether or not an airbag is also provided at their seating position to minimize the risk of severe injury or death in the event of a crash. Do not sit or lean unnecessarily close to the airbag while the vehicle is in motion. 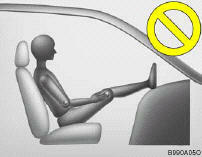 o Sitting improperly or out of position can result in serious or fatal injury in a crash. All occupants should sit upright with the seat back in an upright position, centered on the seat cushion with their seat belt on, legs comfortably extended and their feet on the floor until the vehicle is parked and the ignition key is removed. o The SRS airbag system must deploy very rapidly to provide protection in a crash. If an occupant is out of position because of not wearing a seat belt, the airbag may forcefully contact the occupant causing serious or fatal injuries. The SRS consists of the following components: 1. Driver's Airbag Module. 6. Driver's and Front Passenger's Seat Belt Usage Sensors/Buckle pre-tensioner. 7. Driver's and Front Passenger's Seat Position Sensors. 8. SRS Service Reminder Indicator (SRI). 9. SRS Control Module (SRSCM). 10.Occupant Classification System (Front passenger's seat only). 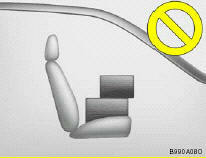 11.Passenger Airbag Off Indicator (Front passenger's seat only). The SRSCM continually monitors all elements while the ignition is "ON" to determine if a frontal or near-frontal impact is severe enough to require airbag deployment or pre-tensioner seat belt deployment. The SRS service reminder indicator (SRI) on the instrument panel will illuminate for about 6 seconds after the ignition key is turned to the "ON" position or after the engine is started, after which the SRI should go out. The airbag modules are located both in the center of the steering wheel and in the front passenger's panel above the glove box. When the SRSCM detects a sufficiently severe impact to the front of the vehicle, it will automatically deploy the front airbags. Upon deployment, tear seams molded directly into the pad covers will separate under pressure from the expansion of the airbags. Further opening of the covers then allows full inflation of the airbags. A fully inflated airbag, in combination with a properly worn seat belt, slows the driver's or the passenger's forward motion, reducing the risk of head and chest injury. After complete inflation, the airbag immediately starts deflating, enabling the driver to maintain forward visibility, and the ability to steer or operate other controls. When installing a container of liquid air freshener inside the vehicle, do not place it near the instrument cluster nor on the instrument panel surface. If there is any leakage from the air freshener onto these areas (instrument cluster, instrument panel or air ventilator), it may damage these parts. If the liquid from the air freshener does leak onto these areas, wash them with water immediately. o If an airbag deploys, there may be a loud noise followed by a fine dust released in the vehicle. These conditions are normal and are not hazardous - the airbags are packed in this fine powder. The dust generated during airbag deployment may cause skin or eye irritation as well as aggravate asthma for some persons. Always wash all exposed skin areas thoroughly with lukewarm water and a mild soap after an accident in which the airbags were deployed. o The SRS can function only when the ignition key is in the "ON" position. If the SRS SRI does not illuminate or continuously remains on after illuminating for about 6 seconds when the ignition key is turned to the "ON" position, or after the engine is started, illuminates while driving, the SRS is not working properly. If this occurs, have your vehicle immediately inspected by your Hyundai dealer. o Before you replace a fuse or disconnect a battery terminal, turn the ignition key to the "LOCK" position or remove the ignition key. Never remove or replace the air bag related fuse(s) when the ignition key is in the "ON" position. Failure to heed this warning will cause the SRS SRI to illuminate. The Occupant Classification system is designed to detect the presence of a properlyseated front passenger and determine if the passenger's front airbag should be enabled (may inflate) or not. The driver's front airbag is not affected or controlled by the Occupant Classification system. If the front passenger seat is occupied by a person that the system determines to be of adult size, and he/she sits properly (sitting upright with the seatback in an upright position, centered on the seat cushion with their seat belt on, legs comfortably extended and their feet on the floor), the "PASSENGER AIR BAG OFF" indicator will be turned off and the front passenger's airbag will be able to inflate, if necessary, in frontal crashes. You will find the "PASSENGER AIR BAG OFF" indicator on the center facia panel. This system detects the conditions 1~4 in the following table and activates or deactivates front passenger airbags based on these conditions. *1)The system judges a person of adult size as an adult. When a smaller adult sits in the front passenger seat, the system may detect him/ her as a child depending on his/her physique and posture. *2) When a larger child who has outgrown a child restraint system sits in the passenger seat, the system may detect him/her as an adult depending on his/her physique and posture. *3)Never install a child restraint system on the front passenger seat. o NEVER put a heavy load in the front passenger seat. o NEVER excessively recline the front passenger seatback. o NEVER sit with hips shifted towards the front of the seat. When an adult is seated in the front passenger seat, if the "PASSENGER AIR BAG OFF" indicator is on, turn the ignition key to "LOCK" and ask the passenger to sit properly (sitting upright with the seat back in an upright position, centered on the seat cushion with their seat belt on, legs comfortably extended and their feet on the floor). Restart the engine and have the person remain in that position. This will allow the system to detect the person and to enable the passenger airbag. If the "PASSENGER AIR BAG OFF" indicator is still on, ask the passenger to move to the rear seat. Do not allow an adult passenger to ride in the front seat when the “PASSENGER AIRBAG OFF” indicator is illuminated, because the airbag will not deploy in the event of a crash. If the "PASSENGER AIR BAG OFF" indicator remains illuminated after the passenger repositions themselves properly and the car is restarted, Hyundai recommends that passenger move to the rear seat because the passenger's front airbag will not deploy. 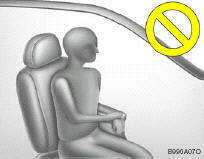 Front seat passengers must stay properly seated to avoid serious injury from a deploying airbag. The "PASSENGER AIR BAG OFF" indicator illuminates for about 4 seconds after the ignition key is turned to the "ON" position or after the engine is started. If the front passenger seat is occupied, the occupant classification sensor will then classify the front passenger after several more seconds. If the occupant classification system is not working properly, the SRS airbag warning light on the instrument panel will illuminate because the passenger's front airbags are connected with the occupant classification system. If there is a malfunction of the occupant classification system, the "PASSENGER AIR BAG OFF" indicator will illuminate and the passenger's front airbags will not inflate in frontal impact crashes even if there is adult occupant in the front passenger's seat. If the SRS airbag warning light does not illuminate when the ignition key is turned to the "ON" position, remains illuminated after approximately 6 seconds when the ignition key is turned to the "ON" position, or if it illuminates while the vehicle is being driven, have an authorized Hyundai dealer inspect the occupant classification system and the SRS airbag system as soon as possible. o Even though your vehicle is equipped with the occupation classification system, never install a child restraint system in the front passenger's seat. A deploying airbag can forcefully strike a child resulting in serious injuries or death. Any child under 13 years of age should ride in the rear seat. Children too large for child restraints should use the available lap/shoulder belts. No matter what type of crash, children of all ages are safer when restrained in the rear seat. o If the "PASSENGER AIR BAG OFF" indicator is illuminated when the front passenger's seat is occupied by an adult and he/she sits properly (sitting upright with the seatback in an upright position, centered on the seat cushion with their seat belt on, legs comfortably extended and their feet on the floor), have that person sit in the rear seat. o Do not modify or replace the front passenger seat. Don't place anything on or attach anything such as a blanket or after market seat heater to the front passenger seat. This can adversely affect the occupant classification system. o Do not sit on sharp objects such as tools when occupying the front passenger seat. This can adversely affect the occupant classification system. o Do not use accessory seat covers on the front seats. o Accident statistics show that children are safer if they are restrained in the rear, as opposed to the front seat. It is recommended that child restraints be secured in a rear seat, including an infant riding in a rear-facing infant seat, a child riding in a forward-facing child seat and an older child riding in a booster seat. o A smaller-stature adult who is not seated correctly (for example: seat excessively reclined, leaning on the center console, or hips shifted forward in the seat) can cause a condition where the advanced frontal airbag system senses less weight than if the occupant were seated properly (sitting upright with the seatback in an upright position, centered on the seat cushion with their seat belt on, legs comfortably extended and their feet on the floor). This condition can result in an adult potentially being misclassified and illumination of the "PASSENGER AIR BAG OFF" indicator. Your Hyundai is equipped with a side impact airbag in each front seat. The purpose of the airbag is to provide the vehicle's driver and/or the front passenger with additional protection than that offered by the seat belt alone. The side impact airbags are designed to deploy only during certain side-impact collisions, depending on the crash severity, angle, speed and point of impact. The side impact airbags are not designed to deploy in all side impact situations. o The side impact airbag is supplemental to the driver's and the passenger's seat belt systems and is not a substitute for them. Your seat belts must be worn at all times while the vehicle is in motion. The airbags deploy only in certain side impact conditions severe enough to cause significant injury to the vehicle occupants. o For best protection from the side impact airbag system and to avoid being injured by the deploying side impact airbag, both front seat occupants should sit in an upright position with the seat belt properly fastened. The driver's hands should be placed on the steering wheel at the 9:00 and 3:00 o'clock positions. o Do not use any accessory seat covers. o Use of seat covers could reduce or prevent the effectiveness of the system. o Do not install any accessories on or near the side impact airbag. o Do not place any objects over the airbag or between the airbag and yourself. o Do not place any objects (an umbrella, bag, etc.) between the front door and the front seat. Such objects may become dangerous projectiles and cause injury if the supplemental side impact air bag inflates. o To prevent unexpected deployment of the side impact air bag that may result in personal injury, avoid impact to the side airbag sensor when the ignition key is on. Curtain airbags are located along both sides of the roof rails above the front and rear doors. The curtain airbags are designed to deploy only during certain side impact collisions, depending on the crash severity, angle, speed and impact. The curtain airbags are not designed to deploy in all side impact situations, collisions from the front or rear of the vehicle or in most rollover situations. o The SRS is virtually maintenance free and there are no parts you can safely service by yourself. If the SRS SRI (Service Reminder Indicator) does not illuminate, or continuously remains on, have your vehicle immediately inspected by your Hyundai dealer. o Any work on the SRS system, such as removing, installing, repairing, or any work on the steering wheel must be performed by a qualified Hyundai technician. Improper handling of the airbag system may result in serious personal injury. o Do not install a child restraint system in the front passenger seat position. o If your car was flooded and has soaked carpeting or water on the floor, don't try to start the engine; have the car towed to an authorized Hyundai dealer. o Do not replace the bumper or the bumper guard with the one other than the Hyundai genuine parts. Otherwise, it can adversely affect SRS performance and lead to an increased risk of injury. o Passengers should not move out of or change seats while the vehicle is moving. o Do not place items under the front seats. Placing items under the front seats could interfere with the operation of the supplemental restraint system sensing components and wiring harnesses. o Never hold an infant or child on your lap. The infant or child could be seriously injured or killed in the event of a crash. All infants and children should be properly restrained in appropriate child safety seats or seat belts in the rear seat. If you modify your vehicle by changing your vehicle's frame, bumper system, front end or side sheet metal or ride height, this may affect the operation of your vehicle's airbag system.